Nacho Barbero - LAPT Punta del Este Champion! Three hundred seven players entered this year's LAPT Punta del Este. Some four days later, all of the chips are stacked in front of just one man. That man, Team PokerStars Pro Jose "Nacho" Barbero, has just knocked out Nicolas Cardyn, sealing the deal and capturing the title of Champion here in Punta del Este. Barbero bested some of the best names in poker these last few days, coming out on top against some serious competition. Among the amateurs in the field were a number of big-name pros, including Team PokerStars Pros Humberto Brenes, Alexandre Gomes, Andre Akkari, Pieter de Korver, and Maria Mayrinck. The battle was hard-fought today as well, with fierce action throughout. Barbero came into the day sixth in chips and certainly played with one goal in mind; winning the tournament. He built up his stack, he was on the short stack, and when the dust settled at the end of the day, he was the only man left standing with chips. For his efforts this week, Jose "Nacho" Barbero will take home $279,330! 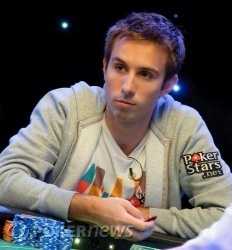 The first hand back, Nacho Barbero limped in and Nicolas Cardyn shoved for about 1,000,000. Nacho snap-called with and Nicolas turned over a dominating . The flop came down keeping Nicolas well out in front. No sweat card came on the turn as the fell, leaving Nacho just three outs to end the tournament. The room explodes with celebration as Nacho Barbero spikes the three outer. 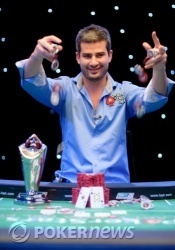 Nicolas Cardyn put up an excellent fight, taking second place for $161,550. There was an issue with the last hand, but it appears it's been sorted now. The two men are back in their chairs, and the cards are back in the air. After the last hand, Nacho Barbero stormed off the stage, looking a bit peeved. It was hard to gather the details, but it sounded like he was complaining that the dealer made a huge mistake, possibly involving the payout of that all-in bet. We're really not sure, to be quite honest. Either way, the clock has been paused, and it appears we're on an impromptu break. Nicolas Cardyn opened to 220,000 from the button, and Nacho Barbero three-bet him for the first time in this heads-up duel. He made it 600,000 straight, and Cardyn tanked and called. With well over 1 million already in the pot, the two men saw a flop of . Barbero was first to speak, and he continued the aggression with a leverage bet of 500,000. After about a minute of tank time, Cardyn announced an all in, and Barbero quickly made the call for his own tournament life, committing his final 2.01 million chips to the pot. Barbero was well ahead with his two pair, and Cardyn was drawing dead to two running cards. The turn satisfied the first half of the runner-runner equation, giving Cardyn a few outs to fill in his open-ended straight draw. The crowd pressed in toward the ropes as the two respective cheering sections yelled for the cards they wanted to see. Those cheering for the were happy after the river, as that rag filled out the board to lock up the monstrous pot for Barbero. Cardyn was at risk but ahead, and the dealer would do her part to ensure his survival. She ran out a board of , and that secures a big double up for Cardyn. A limped pot brought out a flop of . Both players checked and the fell on the turn. Nicolas checked, Nacho bet 80,000, and Nicolas called. The river brought similar action, this time with Nicolas check-calling 160,000. Nacho showed and Nicolas mucked. However, Nacho asked to see his hand and the dealer flipped over the .